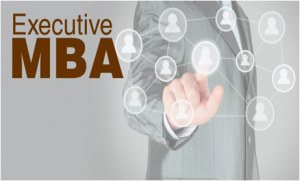 Executive Master (EM) or Master of Advanced Studies (MAS) is an advanced level of master’s degree designed especially for mid-career executive professionals. Common titles of the degree are executive master of arts, executive master of science or area specific titles like executive master of business administration, executive master of communication or Executive Master of Advanced Studies in Humanitarian Logistics and Management (MASHLM), etc. Executive master’s programs are usually attended by full time working professionals, therefore the programs are scheduled to match this condition. Most executive master’s programs run several full days (not more than a week) per month for the period of two or three years. However, some options have similarly adapted schedules, offering classes nights or weekends only. The most condensed of such programs can be completed in as little as a year. According to the Bologna system, program participants are required to gain 60 ECTS to complete the degree. In other systems, the duration of the program is dependent on the total number of academic credits and the number of course credits it is possible to complete in a given semester. Executive Master of Science in Communication (EMScom, MScom) is designed for corporate communication professionals with a significant experience in the sphere. EMScom programs run on the same level as EMBA and usually consist of short learning sessions, evenly distributed throughout the total number of years required (for example: 7-day-sessions every two months during two years). Courses: Typically, one third of the program will cover general management topics (as in general EMBA). The other two thirds deal with the whole bandwidth of themes specific to corporate communication. SDA Bocconi School of Management – Bocconi University (Milan, Italy) and ESADE Business School (Barcelona, Spain) offers a conjoint Executive Master Degree in Marketing & Sales Program. Executive Master in Marketing & Sales (EMMS) is designed for Marketing & Sales professionals with a significant experience and who wants to sharpen their skills. EMMS program run on the same level as EMBA and consist of 7 rigorous modules (each module has 7 days) in 14 months. Binghamton University offers an Executive Master of Science in Health Systems. The program is available in two tracks: Master of Science in Industrial and Systems Engineering (ISE) with Health Systems Concentration; Master of Science in Systems Science (SS) with Health Systems Concentration. An engineering background (or completion of fitting prerequisites) is required for conferral of the ISE degree, while the SS degree is open to all academic majors.